Recent research indicates that up to 50% of all respiratory protective equipment (RPE) used does not offer the wearer the level of protection expected and one of the main reasons is that it simply does not fit. Under the regulations RPE must be correctly selected and tested by a competent test provider. Qualitative fit testing is a simple pass/fail test based on the wearer’s subjective assessment of the leakage of a test agent, via the face seal area. Quantitative fit testing provides a numerical measure of the fit which is called the fit factor, giving an objective measure of face fit. This test requires specialized equipment and is required for full face masks. Whether you choose qualitative or quantitative face fit testing will depend on the type of mask you wish to use and your budget. Both tests must be carried out by competent face fit testers. Basically, the test kit will test how well a respirator fits the wearer. A chamber or hood surrounds the wearer’s head and face, then a solution is introduced to the air inside. If the wearer can taste the bitter solution, the respirator will fail the test for that wearer. A pass indicates that the wearer could not taste the solution during the test – learn more about the basics of face fit testing now. The wearer should not eat, drink (except water), smoke or chew gum for at least 15 minutes before the test. Qualitative fit testing can be used on what are defined as tight fitting respirators, with the exception of full face masks. Full face masks can not be tested because the test hood is not large enough for the mask fitted with a filter – they can only be tested using the quantitative method. Dust and half masks commonly fail the test because of poor fitting and care by the wearer. The seal between the face and the edge of the mask is the most common problem area. 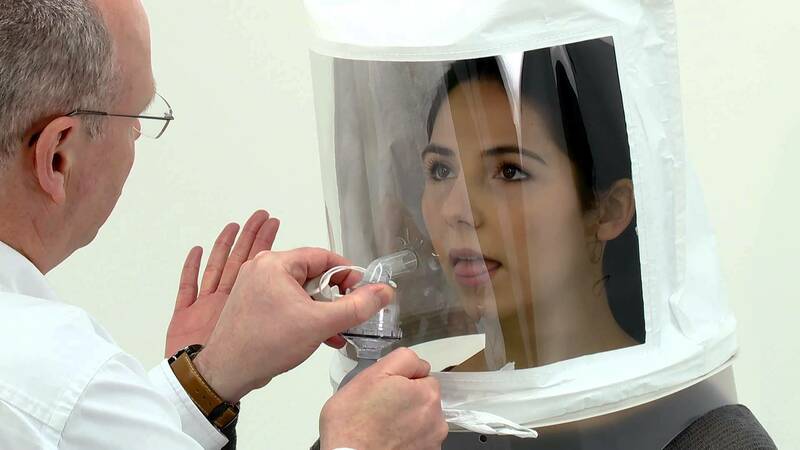 This test employs a hood to create a small test chamber around the wearer’s head, and a test solution, which has a bitter taste. It is often referred to as a “sensitivity test”. It is carried out to check that the wearer can detect the taste of the test aerosol or detect the banana like smell employed in the odour test. While squeezing the aerosol bulb several times, look carefully to confirm the device is creating a mist. Allow some time before administering the fit test. The wearer should make head and body movements to simulate those made whilst working, breathing normally. Once the person has completed the testing without tasting the mist, they have passed the test. If at any time the wearer does taste the solution, take the hood and respirator off the person, give them a drink of water, wait a while then repeat the entire test. Two failed tests are likely to indicate that the type of facepiece being used is unsuitable for whatever reason for the test subject. Another size, make or model of respirator may be tried using the same testing process. As the tester, you should keep records of the testing process for each person. For employers who often require employees to wear RPE, learning how to effectively perform a qualitative face fit test can be a good way of keeping costs down, since it doesn’t involve the more expensive test kits that are required for quantitative face fit testing. Unlike qualitative methods, this type of testing isn’t reliant on the person, and uses methods such as particle counting to measure effectively the quality of the seal. The wearer is required to engage in exercises that will simulate normal work practices to check the validity of the seal. The testing kit will then measure the number of particles that enter the mask. A face fit testing kit will demonstrate how well a respirator fits the wearer. A chamber or hood, surrounds the wearer’s head and face, then a solution is introduced to the air inside. If the wearer can taste the bitter solution, that respirator would fail the test for that wearer. If the wearer can not taste the solution, then the respirator passes the test for the duration of the test. If the test fails, another respirator can be used until a particular one passes the test. This is a very cost effective method of assessing the effectiveness of the selected respirator or facepiece, and also the wearer receives valuable training on how to fit and use the facepiece. The kits are usually compatible with testing FFP1, FFp2 and FFP3 filtering facepieces, half facemask respirators and dust masks fitted with particulate combined filters. The kits do not usually require the tester to attend expensive training courses. However, those doing the testing should be competent in the procedures and testing requirements. It is an essential piece of equipment under the COSHH Regulations to help demonstrate compliance with the requirements for face fit testing of respirators and dust masks.